One thing I’m learning about myself during this process is that I really like wearing skirts. I think they are so much more comfortable than shorts. And, in my opinion, shorts are very difficult to pull off. You really need to have very long and very skinny legs to look great in shorts. Since I am neither really tall or really skinny, I’ll stick to skirts. I know, I know, I did wear shorts a few weeks ago- and once in a while rules are meant to be broken, right? 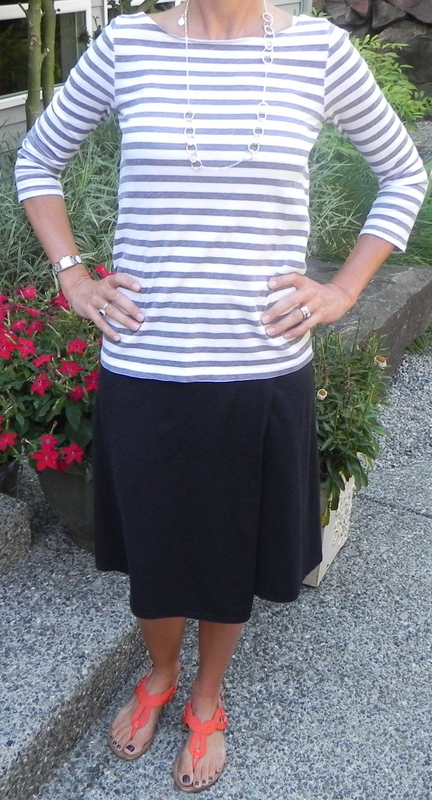 I was in a hurry to get out the door today, so I put on my North Face skirt and a grey and white striped t-shirt. I added a necklace and my orange sandals for a little burst of color. Not the most exciting outfit- but it’s easy and comfortable.